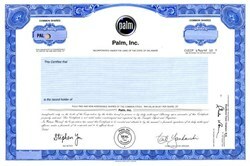 Beautifully engraved specimen certificate from Palm, Inc. . This historic document was printed by the American Banknote Company and has an ornate border around it with a vignette of the Company's logo. This item has the printed signatures of the Company’s Chief Executive Officer, and Secretary. 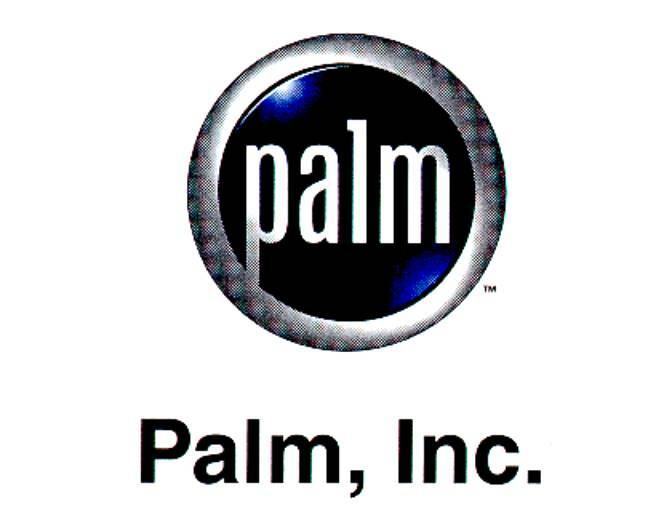 Palm, Inc., was an American smartphone manufacturer headquartered in Sunnyvale, California, that was responsible for products such as the Pre and Pixi as well as the Treo and Centro smartphones. Previous product lines include the PalmPilot, Palm III, Palm V, Palm VII, Zire and Tungsten. While their older devices run Palm OS Garnet, four editions of the Treo run Windows Mobile. In early 2009 Palm announced a new operating system, webOS, replacing the original Palm OS Garnet in their newest devices. On April 28, 2010, Hewlett-Packard announced that it had agreed to acquire Palm for $1.2 billion. The deal was completed on July 1, 2010. The Palm global business unit was to be responsible for webOS software development and webOS based hardware products, from a robust smartphone roadmap to future slate PCs and netbooks. However, on August 18, 2011, HP announced that it would discontinue production of all webOS devices, including smartphones and tablets. On August 15, 2012, it was revealed that HP had created a wholly owned subsidiary, Gram, made up of the remaining components of Palm.